Why Should You Become an Associate Member? LeadingAge Kansas connects you with decision makers at our Conference Events and in our publications. We also provide you a current list of our members and their contact information. Our members also can use our website to search for new vendors when in need of a new product or service. Being an Associate Member of LeadingAge Kansas helps you show current and prospective clients you support their mission. That partnership says a lot to our members. 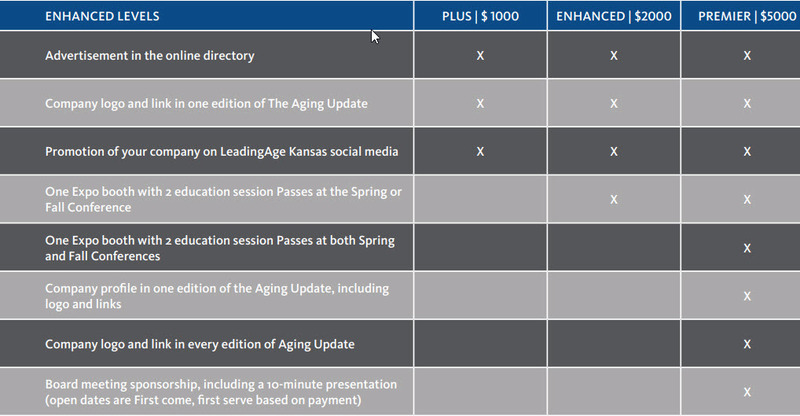 LeadingAge Kansas Associate Members receive all association communications, including upcoming education programs and weekly Aging Update. Associate Members also have the opportunity to highlight their company in these communications, depending on their level of membership. from the rest at the same time. Make the most of your Associate Membership and join a committee! This is a new offering for Associate Members and will give you the opportunity to interact with our members in other ways and effect change in our industry. LeadingAge Kansas hosts Regional Roundtables across the state twice each year to give members an opportunity to come together and hear what LeadingAge Kansas is doing, as well as share with each other. The reimbursement committee identifies issues related to the Medicaid reimbursement system and the Medicare Prospective Payment System. They also help develop appropriate LeadingAge Kansas responses. They will meet on an as-needed basis. This group meets twice a year to network and share information about current survey trends, workforce challenges, data collection and much more. The billing committee is designed to address member needs with Medicaid, Medicare and primary insurance billing. They share and obtain information from peers as well as representatives from insurers. The committee will meet three times per year. LeadingAge Kansas reserves the right to determine whether a company qualifies for a membership. Associate members operating unethically or in a way that will negatively reflect upon the association will be removed from the roster and disallowed from participating in association events. We reserve the right to schedule some benefits based on our marketing schedule. We will work with associates to accommodate their schedules when possible. Membership is for the calendar year. Pro-rated membership is available in June, but benefit availability may be limited. Associate membership does not indicate endorsement or support of a particular product or service by LeadingAge Kansas or its Board of Directors. LeadingAge Kansas is sensitive to competition between companies when assigning sponsored events. Every attempt will be made to prevent competing companies from sponsoring and speaking at the same event/time frame. Member benefits, including the opportunity for sponsorships, will begin upon payment of dues. Your membership is not active until dues have been paid. Conference participants agree to refrain from marketing products or services during the course of the conference. Registered exhibitors are the exceptions. Violators of this policy will be invoiced the full Associate Member/Exhibitor amount. HOW ARE BOOTH SPACES DETERMINED? The majority of booth and table spaces are determined on a first come, first serve basis. It’s important to sign up early! We try to the best of our ability not to place you next to a competitor, though we cannot make any guarantees. Ultimately, LeadingAge Kansas has the discretion to place companies in the places we deem to be most appropriate. Priority spacing is granted to sponsors and Value First exhibitors. Booth assignment numbers will be provided to you at least two weeks prior to the events. If you have purchased a booth space for the Spring Convention (May 7th), April 23rd is the last day to cancel. If you have purchased a booth space for the Policy Conference (October 2nd), September 18th is the last day to cancel. All cancellations will receive a 50% administrative fee. There will be no refunds granted for cancellations past the deadlines. Each exhibitor assumes entire responsibility and liability for losses, damages and claims arising out of the exhibitor’s activities at the conference site and/or hotel premises and will indemnify, defend, or hold harmless, LeadingAge Kansas, the Hotel, Convention Center, decorating company, their owners and management companies as well as their representative agents and employees from any and all such losses, damages and claims. LeadingAge Kansas, the Convention Center and/or Hotel and decorating company will not be responsible or liable for any loss, damage or claims arising out of an exhibitor’s activities on the Hotel/Convention Center premises, except for any claims, loss or damages resulting directly from its negligence.